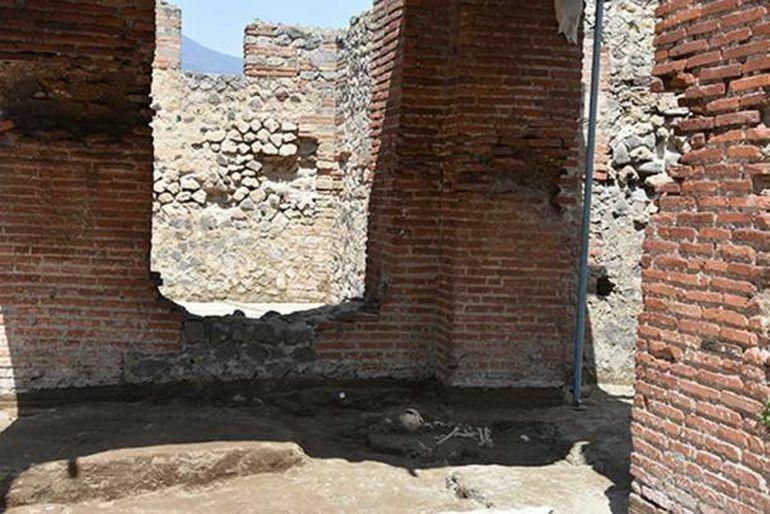 Pompeii, the ancient Roman town-city near modern Naples, boasted an assortment of baths, houses, graffiti, frescoes and even agricultural produce. But more than any of these avenues, the city is best known for our fascination with disaster for over 400 years, after its rediscovery way back in 1599 AD. In fact, the site of Pompeii has been a popular tourist destination for over 250 years – thus merging an unfortunate episode of history (entailing the Vesuvius eruption) and the innate level of human curiosity. However, beyond just the ‘popular’ impact of the disaster, there has always been the historical scope of the disaster with its fair share of poignancy. 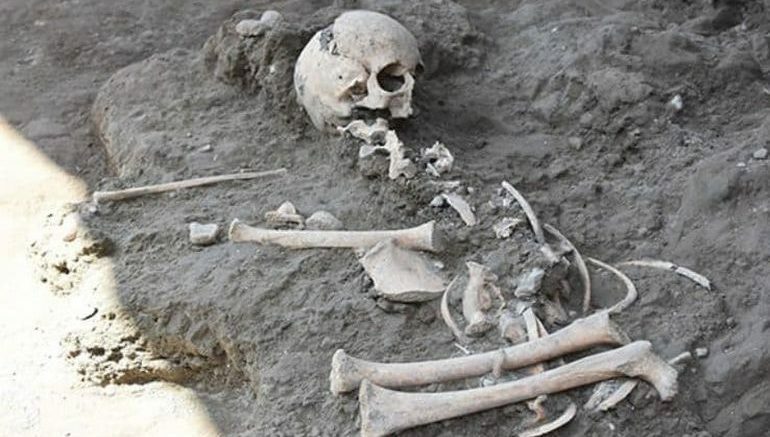 Pertaining to the latter scope, one of the latest discoveries (made in February) has heartrendingly revealed the skeletal remains of a 7-8-year-old child victim who unsuccessfully wanted to seek shelter from the noxious volcanic ash and smoke belched out by Vesuvius, circa 79 AD. 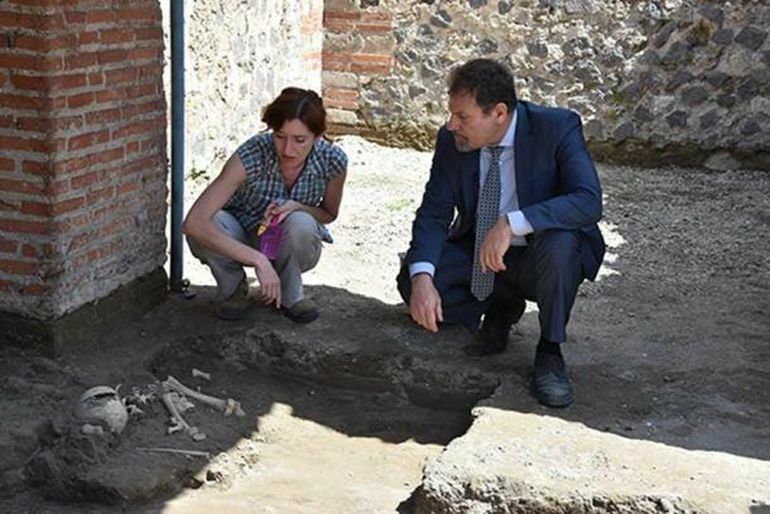 The skeleton of a child was found for the first time in over 50 years at the Pompeii site. The remains were discovered inside the ruins of the Central Baths complex. According to the archaeologists, the terrified child probably wanted to take refuge inside the thermal bath complex after hearing the ominous rumble from the Vesuvius eruption. The crouching position of the skeleton rather reinforces this hypothesis. However, as opposed to a few numbers of fatalities caused by falling debris and structural segments, the young Pompeiian was possibly killed by scorching ash (also known as pyroclastic flow) that engulfed the ancient Roman town. Now objectively, in terms of numbers, the Vesuvius eruption and its immediate aftermath in circa 79 AD, took away the lives of around ten percent of the town’s population, with the death toll possibly crossing over 2,000. The majority of the deaths were either caused by the aforementioned pyroclastic flow or by suffocation due to the noxious fumes of the volcanic ash, while a smaller number were also killed by the falling debris. Interestingly enough, it should also be noted that the overwhelming majority of the population managed to escape due to the ‘warning signs’ exhibited by Vesuvius days before its eruption – that included bellowing out both smoke and ash. Quite intriguingly, researchers came across the discovery quite by chance when they were working on restoring sections of the thermal bath complex. To that end, it has been hypothesized that the flow of hot gas and ash made its way through the windows and door of the bath. The child, who probably already expired by this time, was buried underneath this pyroclastic layer, which then solidified over time with the arrival of rain – thereby encasing the body. In any case, the archaeologists were able to detect the skeleton by means of a technique known as videoscope scanning. Ashes were already falling, not as yet very thickly. I looked round: a dense black cloud was coming up behind us, spreading over the earth like a flood.’Let us leave the road while we can still see,’I said,’or we shall be knocked down and trampled underfoot in the dark by the crowd behind.’We had scarcely sat down to rest when darkness fell, not the dark of a moonless or cloudy night, but as if the lamp had been put out in a closed room.